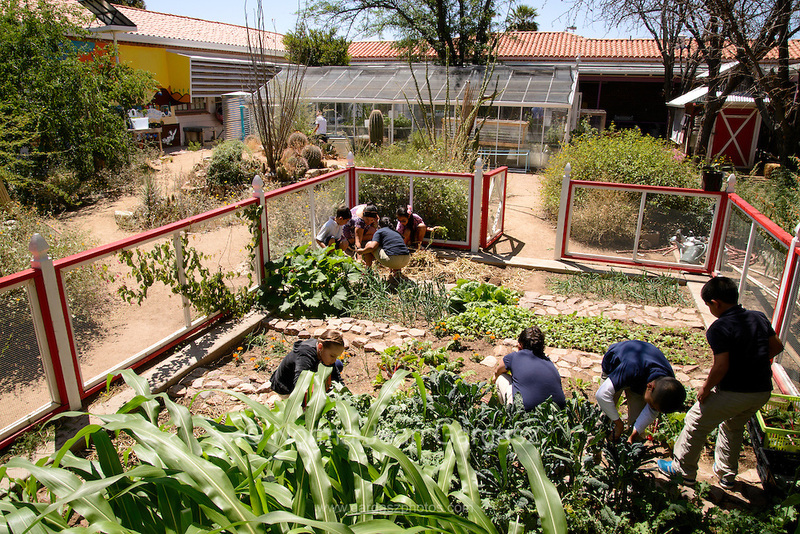 Manzo Elementary School students work in the school's organic garden, Tucson, Arizona, USA. The school was the first in TUSD to be certified for garden to cafeteria food consumption and first in the state of Arizona for rainwater harvesting and composting. The garden projects in the district work with internationally known Biosphere2 and the University of Arizona. The garden was built in conjunction with the National Park Foundation's First Bloom program. The project is supported in part by a USDA Farm-to-School grant. Named Best Green School 2012 by the U.S. Green Building Council, Manzo is the only K-5 public school in the United States to receive that honor in response to their environmental initiatives.